We have a wide selection of dry block heaters also known as block heaters or dry blocks. 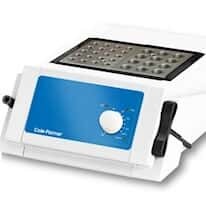 The dry block heater can be used to uniformly and simultaneously heat an entire block of test tubes. These versatile heating systems are ideal for all of your sample heating requirements, or for research or general chemistry applications. We offer dry block heaters in both analog or digitally-controlled versions, and with configurable heating blocks.